Parents are being urged to vaccinate their children following a measles outbreak in West Cork, the HSE has said. Measles is a potentially fatal disease. AN OUTBREAK OF measles amongst teenagers in West Cork has led the HSE to urge parents to vaccinate their children against the disease. All of the teens who contracted the potentially fatal disease were not vaccinated against measles. Twenty five cases have been reported so far - compared to no cases in the first three months of 2012 – and all of those affected are aged between 12 and 18 years of age. Measles can be a serious and potentially fatal illness and children who have not been vaccinated are particularly at risk of measles during this time. This outbreak is affecting children who are not vaccinated. Siblings of children with measles, if not vaccinated, are also recommended to stay out of school or child care during the incubation period (usually around 14 days but may be up to 21 days), to ensure that they do not transmit infection to other children who may be too young for vaccination or be at increased risk due to other conditions. Measles is a highly infectious disease and 1 in 20 who contract it will get pneumonia. One in 1000 people who get measles will get encephalitis and between 1 -2 in 1000 will die from the disease. The only way to be protected against the disease is to have already contracted it or to have received the Measles-Mumps-Rubella (MMR) vaccination. Children are recommended by the HSE to receive two doses of the MMR vaccine, the first at 12months of age and the second at 4 – 5 years of age. The HSE is recommending that parents check their child’s immunisation records to determine if they have received two doses of MMR, and if no records are available the child should be brought to the GP for vaccination. All children/teenagers who have not received two doses of the MMR vaccine can receive it from their GP free of charge. More information on measles and the MMR vaccine can be found at www.immunisation.ie and www.hpsc.ie. A report by the HSE’s Health Protection Surveillance Centre last year showed there was a 149 per cent increase in measles cases in Ireland in 2010. The report showed that the greatest rise in cases were among Traveller and Roma communities and within families who did not have children vaccinated against vaccine-preventable diseases. 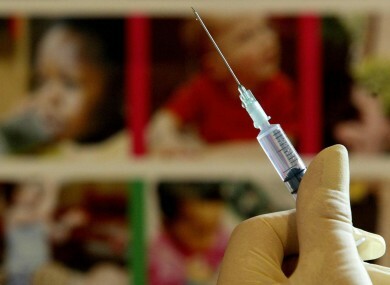 Email “Parents urged to vaccinate children after measles outbreak ”. Feedback on “Parents urged to vaccinate children after measles outbreak ”.